The story out of antiquity shows a single Roman consul, Gaius Popillius Laenas, alone with his two clerks facing the might of the Seleucid Empire which was threatening the Roman protectorate of Egypt in 168 B.C. The old consul’s mission was to force the king to return to Syria. The exchange between the two, as the story itself, has many variations. However, they all boil down to the following: The king, laughing at the diktat issued by the Roman asks the classic version of “you and what army” is going to force me back to Syria away from Egypt. The Roman responds by drawing a circle in the sand and saying that when he steps across the line, he had better be marching toward Syria and not Egypt. The king retreated, and the red line was born. The concept of a red line in international relations is now in-vogue to describe a situation where one nation or coalition sets up a tripwire, which if crossed, will result in dire consequence. It is being overused over the issue of Iran and is being brought up constantly regarding Syria; history comes full circle in the strangest ways. We cannot have a situation where chemical or biological weapons are falling into the hands of the wrong people…We have been very clear to the Assad regime—but also to other players on the ground—that a red line for us is we start seeing a whole bunch of chemical weapons moving around or being utilized. By Dec. 6, 2012 the red line was unilaterally shifted in favor of the Assad dictatorship by removing the injunction of moving chemical weapons, as intelligence indicated had already occurred. This is where the red line stood until reports surfaced in January of 2013 that the Syrians have already used chemical weapons (Agent 15 according to reports) against their own population in the city of Homs on Dec. 23, 2012. This is according to a Department of State cable sent to Main State Headquarters by the U.S. Consul General in Istanbul, Scott Kilner. The State Department and the White House have neither refuted nor confirmed the attack. The Department of State has now used the phrase that it “couldn’t corroborate” the story. The Syrian regime has continuously tested Western resolve and presumably believes that if the West is not going to stop them from killing 60,000 people, then why would the West react because they used chemical weapons? Was the Homs attack a test? Why has the mainstream media completely ignored the story? There is no way to know the truth of the story at this point, but it is more than noteworthy that the alleged attack occurred after the initial red line was breached. If chemical weapons were used it would mark the second time in contemporary memory that a regime has used them against their own populace. This last war crime was conducted by the other Ba’ath Party regime, that of former Saddam Hussein. Further, one can invoke Occam’s Razor simply: An evil Ba’athist dictatorship, whose close ally is the twisted Iranian theocracy, notorious for its support of terrorism and for killing their own people, will use chemical weapons on their own citizens. The situation in Syria is incredibly important in its own right, but the implications for American grand strategy are exponentially critical. Whether or not the United States should have established a red line over the movement and use of Syrian chemical weapons is now an academic question; the issue at play yet again for the current administration in regards to foreign policy is national credibility. If a red line can be cavalierly declared, and then shifted for convenience, then it is no red line at all. It is worse to declare such and not fulfill national obligation than not to have done anything in the first place. The United States has numerous red lines, more than any other nation state around the globe. There are some that are clear and treaty expressed, such as with NATO; with the Australia, New Zealand, United States Security Treaty; and with Japan. There are other de facto red lines that are equally obligatory and far reaching, such as with Israel, Taiwan, and the global War on Terror. A nation that lacks the most basic level of international relations credibility is a nation that cannot act on the international scene successfully. It is too bad that we can’t resurrect that old Roman consul who understood what must be done when dealing with any barbarian. The nation had to prove it was a nation. It had to prove that it could fight and win. It, like so many nations today, had to receive assistance from a foreign power in order to gain its freedom and independence. That nation seeking assistance would become the United States; the nation offering help following the Battle of Saratoga was France. Twice, American men died to preserve the independence of America’s oldest ally and now, through many years of turbulence and trials there is another window of opportunity to test our mettle in support of the French Republic. France should be applauded. She took the opposite view of the Obama administration in Libya and the continued U.S. ambiguity that has left over 60,000 Syrians dead. France acted before the tragedy became worse. It is therefore no surprise that the Obama administration is shielding itself from full support by criticizing the hastiness of the French operation. One would assume this sentiment is not shared by the civilians being brutalized by the Islamic extremists. The French have requested a greater U.S. role, but the Obama administration seems comfortable with only logistical support. Thus far, the United States has provided military transport, limited refueling, and nonlethal equipment. The latest news is that the United States is considering a UAV airbase in Niger, primarily for surveillance. The short-term concern from the American side was over who was going to pay for the American aid. The long-term interest was over France’s exit strategy. The Obama administration has touted Libya as the model for an “Obama Doctrine.” In fact, the inaction in Libya, and the lack of overt leadership following Qadhafi’s downfall led in part to the trouble in Mali with foreign fighters spilling over into the rest of North Africa. The decisive use of American power early could have prevented much of this (and the tragic events in Benghazi). The situation in Mali from a realist point of view is one where the Islamic extremists could use Mali as a base of operations. From a liberal point of view the atrocities committed by the extremists cannot go unanswered. Western forces, as much as they can stop Islamic extremist atrocities, can also prevent Malian government and African force retaliation. On Tuesday, Toria Nuland of the Department of State said, “What I will say is that the U.S. military is not going to be engaged in combat operations in Mali, and we don’t expect U.S. forces to become directly involved on the ground in combat either. So this is a discrete set of missions in support of our French ally in the efforts that they are making to support the people of Mali.” The statement is fantastical on many grounds, but in particular the administration’s allergy to understanding the global War on Terror. Mali has become a node in the global War on Terror like it or not. Do we seek victory in this conflict or simply accommodation? The United States needs to give clear and unambiguous support to our French ally. This support can be in transportation, refueling, surveillance, armed drones, air strikes, and if necessary, a larger military presence, that is overt and direct. The issue that the media has focused on is the actual issue of Mali, important in its own right. However, the issue for American grand strategy is three-fold, and the relationship with France is deep, historical, and cultural and goes well beyond paper treaties. First, are we serious about victory in the global War on Terror? If so, the intervention in Mali is a necessity. Second, are we serious about protecting civilians from the worst aspects of barbarism? If so, to support the French is not a question. Lastly, is all the talk of alliances and renewed friendships more than talking points? If so, the support our oldest ally in her just cause is obligatory. Do we seriously expect France to side with the United States in future conflicts if we fail to honor the alliance? In December this column discussed the issue of alliances, focusing in particular on Great Britain. This is the second column of this series, focused on Japan. In an age of promoting “burden sharing” and perceived American decline, the importance of alliances cannot be overstated. This deterioration of American leadership has often led to a neglect, or even abuse of our closest friends. As stark was the case concerning the United Kingdom, so too is the situation with Japan. The “pivot to Asia”, as yet both undefined and undetermined, is nothing new. From the early 20th century onward, the United States has maintained four clear grand strategy goals in the Pacific: encourage market economies and democratic political systems, assure U.S. access and influence, encourage regional peace, and maintain stability and balance of power. The saga of U.S.-Japan relations began in 1853 in archetypical gunboat diplomacy, with four American warships backing a diplomatic mission to open the country to American influence, trade, and ports of safety. This created the terms for a complex and symbiotic relationship. If our closest ally overall is Great Britain, a relationship born of revolution and two wars, our relationship with our most trusted partner in Asia was born of cannon and shot. The irony of Pearl Harbor is not lost on those students of history. Since the Second World War, Japan has been engaged in the role as America’s unsinkable aircraft carrier, and key to America’s entire strategy in Asia and the Pacific. There is simply no more important relationship to American national security in northeast Asia than Japan. In partnership with Australia, South Korea, and Taiwan, the United States is able to fulfill all four grand strategic goals. The Mutual Security Treaty system makes clear to any enemy of Japan, that an attack upon Japan is an attack upon the United States. Japan, criticized by many in the media, may not reciprocate until she changes Article 9 of her American engineered constitution. The Cold War ensured that the relationship between the United States and Japan remained fixed. However, since 1991 the wind of change has been blowing. President Clinton prior and President Obama currently have devalued the relationship at a very critical time. Japan has been placed in a situation of anxiety over our hot and cold relationship with China, and our ambiguity regarding North Korea and Taiwan. This has been exacerbated by talk of American declinism and an inability to fully articulate what the “pivot to Asia” means in real terms. The election of Prime Minister Shinzo Abe re-opens a window for U.S.-Japan relations. Abe campaigned on a platform that stressed the alliance with America. The recent dust up over the Senkaku Islands where Japan recently scrambled F-15 fighters to reassert sovereignty after Chinese air and maritime incursions could be used to solidify U.S.-Japan relations. Japan established sovereignty in 1895, and China, notably, did not object to the islands falling under American control when the United States established the occupation of Japan and its territories. It was not until the 1970s, when oil was suspected, did China began to make claims. The United States views the Mutual Security System with Japan as unshakable. The United States actively supports and promotes a bilateral Free Trade Agreement with Japan. The United States recognizes the sovereignty of Japan over the Senkaku islands. The United States should act as a mediator in establishing a diplomatic understanding between Japan and Taiwan over the Senkaku islands and the resources thereof. The United States will extend any National Missile Defense with a Theatre Missile Defense to protect Japan, and our other Asia-Pacific allies. The United States views any provocation by North Korea against Japan as a provocation against the United States. The vagaries of the territorial dispute are no longer relevant. Similar to the case of the Falkland Islands (see article on Dec. 20, 2012), the United States has an opportunity to show the world that America is a steadfast supporter of its friends, and an adamant enemy of those who seek to undermine them. The United States has no interest in a sequel to the 1895 Sino-Japanese war, nor does it have an interest in rewarding Chinese neo-imperialism. For the past two weeks this column focused on threats and solutions to immediate national security threats that the United States faces. In both cases grand strategy has been mentioned. The very concept of an American Grand Strategy has almost vanished from any discussion of national security and foreign policy. Neither the current occupant of the White House, nor the many (though not all of) former Republican challengers were discussing, let alone promoting, a grand strategic vision for the United States. Some have come up with pieces of national security and foreign policy, but few have any sense of where the country should journey in order to protect American vital and national interests; few have presented a vision to guarantee American primacy, prosperity, and values. There is an assumption that expressions such as national security, foreign policy, national security doctrines, grand strategy, vital, and national interests are the same concept; they are not. The most talked about issue today in national security is counterterrorism. Thus, a common mistake made by many is to assume that the specific and tactical policies of counterterrorism are, in and of themselves, national security policy or even national security strategy. In this example, counterterrorism is merely a specific policy that is subordinate to the national security policy of the immediate time. If the American people are lucky, this immediate national security policy is somewhat clear and cohesive. Unfortunately, we often do not even receive this level of consistency. The myopic view becomes commonplace and grand strategy vanishes from discussion. This has occurred most recently concerning the debates on Afghanistan. The reverse, perverse logic goes like this: Since we killed Osama Bin Laden, we need to leave Afghanistan since we were there to capture or kill him and other terrorists. In reality, Afghanistan is part of a grand strategy to protect the United States from Islamic extremism and to stabilize a geopolitical area to promote United States interests. This grand strategy cannot be achieved by conducting counterterrorist operations alone. The way that a future presidential candidate (and president for that matter) can differentiate himself from others is to clearly and concisely promote a grand strategy that not only addresses the issues of today, but also ensures American supremacy for the future. Naturally, a counter to this will be obsessions over the economy and jobs, but a country without a grand strategy is not only an airplane without a pilot, but an airplane that will either crash and kill all aboard, or be hijacked by a hostile power. What would this grand strategy entail? It would be announcing and adhering to a permanent national security doctrine. It would embrace a grand strategy that can cross party lines, time periods, and changes of administrations. Thus, ideally the United States would abandon doctrines named after presidents in favor of presidents who adhere to an American doctrine. 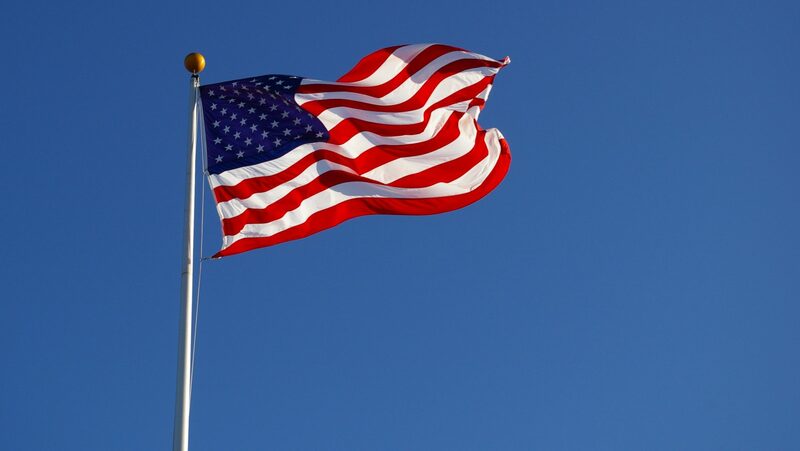 This American doctrine would consistently adhere to nine grand strategy themes: American exceptionalism, expansion, the empire of liberty and democracy promotion, free commerce, unilateralism, internationalism, the American way of war, geopolitics, and primacy. 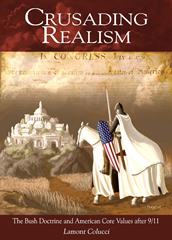 It would need to be embraced in a bipartisan fashion, truly holding to Daniel Webster’s quotation, “Even our party divisions, acrimonious as they are, cease at the water’s edge.” The result of adopting an American doctrine would be the inability of any particular administration to repudiate a doctrine based on the United States’s long history, storied traditions, and absolute values. There would immediately be six decisive and positive results for the United States and the world. It would root national security strategy and foreign policy in natural law, resulting in practical policies based on the promotion of civil society, democracy, human rights, and liberty under law. It would create the conditions for international credibility and consistency. It would accept the necessity of pre-emption and prevention. It would recognize the need for primacy. It would adopt a systemic policy and solution to tyranny and extremism. It would jettison the fallacy of deterrence and containment with transnational extremists and rogue states. 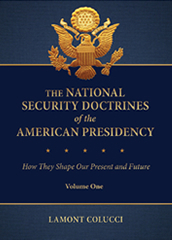 National security doctrines grew out of the trials and tribulations of American civilization. They evolved by being anchored in nine American themes that guided the nation through revolution, war, and turmoil. They can guarantee liberty, prosperity, and security as they guide the American nation and people into the 21st century and beyond. Last week this column addressed the threats to the Republic for 2013 with a promise to address solutions to those threats this week. This week’s column should not be read in a vacuum as the detailed aspects of threats were illustrated in last week’s commentary. Based on a two volume book I recently authored on national security doctrines, the solutions to these threats must be tackled from both a historical and contemporary lens; these solutions must fundamentally serve American grand strategy. 1. Al Qaeda and terrorism. A national security doctrine that does not attempt to gain victory at a strategic level, well beyond the tactics of counterterrorism, is doomed to failure. The strategy must be one that uses the full power of the U.S. military, intelligence services, covert operations, and the soft power of democracy-building, economic aid, and a massive effort to counter the hate-driven propaganda. The debate over whether enemy combatants should be a designation should also end, as these terrorists are neither criminals nor prisoners of war and must be dealt with using military tribunals. The United States should push the United Nations to adopt this policy as part of international law, codifying international norms that clearly state that terrorists and pirates do not receive the treatments of prisoners of war or criminals. Further, the United States should have a declared policy that any nation linked to providing any aspect of weapons of mass destruction to a terrorist group will be treated as an act of war. In the end, any future president must treat this as a real war, and not a conflict or a law enforcement exercise. 2. Iraq and Afghanistan. Iraq, whose geostrategic value is immeasurable, can and must be one of the linchpins in any future U.S. Middle East policy. There must be a permanent and lasting commitment to the Iraqi people that demonstrates that the United States will not tolerate Sunni terrorists, Shiite militias, or the machinations of Iran. Obama’s strategy in Afghanistan was predicated on greater European involvement, but the Europeans are extremely suspicious of this and have already followed the leader in announcing troop withdrawals in Afghanistan. The American surge was followed by the declaration of withdrawal. The United States, in classic Nixonian fashion, is ready to abandon another ally and let another region succumb to terror in order to satisfy a lack of geostrategic and historical understanding. The long-term strategic goal of the United States must be to destroy the Taliban, establish law and order, and bring stability to Afghanistan. This will be the only way to ensure that American credibility is respected, and the al Qaeda-Taliban axis cannot use Afghanistan as a terrorist haven. 3. The Arab Spring. The United States must take the strategic lead and be seen to be the greatest supporter of these people. The “leading from behind” mentality of watching from the sidelines with hopefulness has been an abject failure. The United States risks a worse world than the dictators if it fails to lead forcefully. 4. Energy security. The United States will not tolerate any power or group that seeks to deny its people access to petroleum; the United States is prepared to use hard power if that denial occurs; the United States seeks favorable trade relations in energy based on free commerce; the United States will not sacrifice its interests or values for that access; the United States will support prodemocracy adherents and groups that wish to replace despotic petrocracies; the United States will enforce the Carter Doctrine and free navigation; the United States will combine alternative energy sources with the opening of all viable petroleum sources domestically. This must become a permanent and declared strategy, and it must be enforced. 5. Primacy. This not only means maintaining, and most likely expanding, the 11 Carrier Task Forces, but all branches of the military, intelligence, and even diplomatic services. The stability of the international relations system is entirely dependent on U.S. military primacy and the Pax Americana. It must be the permanent strategy of the United States to ensure this primacy continues and expands. Linked to primacy is the development and deployment of a multilayered national missile defense that should ultimately cover our allies. There must also be permanence to the American way of war and a resurrection of the Weinberger Doctrine concerning overwhelming force. American national security at home, during violent riots and looting, and abroad, during war, is served best by swift and massive force. This always results in lower casualties for both U.S. troops and civilians. There are two immediate ways this can occur. The first is to stop any attempt to reduce the defense budget to dangerously low levels. The defense budget must be based not on bean counting but on the grand strategy of the United States designed to protect American vital and national interests. This should be a bipartisan and immediate commitment. The second way is a reinvigoration of the U.S. space program under the auspices of the National Aeronautics and Space Administration. This primarily revolves around the resurrection of manned space flight exploration and a realization that primacy and any future military conflicts will be won by the nation that realizes that a new strategic navalism will be in space: space weapons, space defense, spacecraft, and, ultimately, platforms and bases. The nation that fails to do this will be entirely at the mercy of those nations that achieve space dominance. The evolution and history of military technology, whether it was the longbow, the cannon, the rifle, the tank, or the aircraft carrier, has proved this for five thousand years. 6. Rogue regimes. Iran: The United States must make a permanent and declared policy that it will not tolerate any further development of its nuclear or missile program and that unless Iran reverses its terror strategy, America will consider it an act of war and act accordingly. The United States should be prepared to call on the successful implementation of the Truman, Reagan, and Bush Doctrines to destabilize the regime, use covert operations, prepare for the use of hard power, and assist the prodemocracy elements of Iran with more than rhetoric. Iran can be made to pay a high price for its recalcitrance with the use of American hard power that has nothing to do with the use of conventional ground troops. The Reagan years proved the efficiency of these policies. North Korea: The spotlight of the international community and the United States are on North Korea’s illegal and immoral nuclear weapons program. However, sunlight must be placed on the North Korean gulag. Pivotal to American strategy and inherent to American values is the destruction of these camps by covert and overt means. The United States must make a permanent and declared policy that seeks to remove the North Korean totalitarian regime; declare that any further missile tests will be treated as an aggressive act; stop, by any means necessary, its nuclear program; assist elements in South and North Korea that seek liberation; and prepare concrete plans to assist South Korea in eventual reunification in an effort to avoid one of the potentially worst humanitarian disasters with refugees ever seen. If there are regimes and leaders that are diametrically opposed to American values and interests, these would be Iran and North Korea. We have been in a state of war with both, and it is time that our grand strategy reflects that fact. This war may never require the use of American ground troops. 7. Destabilization of Japan and Mexico. Japan: American grand strategy in the Pacific is predicated on the security alliance with Japan, and Japan’s only sense of stability comes from the same. The United States must reinforce and make permanent the clear and unambiguous relationship and alliance with Tokyo where there is jointness to American and Japanese interests. Mexico: There must be a clear policy toward the Mexican government that the United States will not tolerate the violence and chaos created by Mexican drug cartels. The United States must offer the Mexican government the tools to break the back of the cartels or do the job itself. The current policy of muddling through has produced increased death and violence on both sides of the border and threatens the very existence of a viable Mexican government. 8. Israel and Palestine. There must be a permanent and continuous policy for the support of Israel, and terrorist groups like Hamas and Hezbollah and states like Iran and Syria must be put on notice that an attack on Israel will be treated as an attack on American interests. Further, any support of Palestinian aspirations must be predicated on peace with Israel, recognition of Israel, and the development of Palestinian democracy and civil society. Objective analysts have known for years that the Arab states do not care about the fate of the Palestinians, but it has served the interests of propaganda and domestic consumption. American grand strategy is best served when there is a vibrant democratic civil society for both Israelis and Palestinians. 9. Crisis of confidence in Europe. The most important alliance to the United States is NATO, and NATO requires dynamic American leadership. There must be a reinvigoration of our relations with Europe, with greater integration of security and economics. Western Europe faces, in many ways, a much starker threat of Islamic extremism, and there must be common cause to promote Western values. This cannot happen when America talks more of burden sharing and less of leading. In Eastern Europe, this is even more critical; it was the United States that engineered the expansion of NATO eastward, and now it is America’s responsibility to protect that trust. The people of Poland, Hungary, and the Czech Republic know the price they have paid under the tyranny of Nazis and Communists, and they know that part of that was a betrayal by the Western powers. There must be an unambiguous policy that the grand strategy of the United States includes these people under all conditions. 10. Resurgent Russia and rise of China. Russia: The United States cannot accept the concept of the “near abroad,” granting to Russia the ability to treat sovereign states like Georgia as playthings. It must decide to build a defensive missile system based on its own national security, not on relations with Russia. It must treat any attempt to support rogue regimes as an act of aggression, and it must not forget the state of human rights inside of Russia. China: China must be made to realize that free trade must be fair trade or no trade at all. It does not get a blind eye for its massive human rights violations and should be put on notice that any attempt to use the modernization of its military to threaten American primacy in the Pacific will be treated as an aggressive act. The continued Chinese support of regimes like Iran and Sudan has not gone unnoticed, and there should be no ambiguity about the United States supporting Taiwan. The crux of all 10 threats is the need for declared, unambiguous policy that serves a clear grand strategy. Next week this column will outline that grand strategy in broad terms. The New Year brings reflection and prediction—hope for the future tethered to the problems of the past. 2013 ushers in a host of national security and foreign policy threats that may boil over during the coming year. In a two volume book on national security doctrines I analyzed these threats through the lens going back three centuries. Our republic faces a myriad of threats, but 10 threats stand out as both immediate and long term. In this column I will focus on the problem, and next week the solutions. 1. Al Qaeda and terrorism. The first realization is that a new terrorism emerged in the late 1970s and 1980s, primarily one of Islamic extremism focused on apocalyptical designs to bring about a new Islamic era. These groups, both Sunni and Shiite, are willing to use any means, especially the use of weapons of mass destruction. The groups are divided into core leaders and organizations, franchises, lone wolves, and aspirational individuals who seek maximum destruction. There are about 44 transnational foreign terrorist organizations that seek the destruction of the United States, the American people, and Western civilization in general. The debate over law enforcement versus counterterrorism versus war should long be over. It is a war where all national resources need to be used. The rise of Wahabism, Salafism, and extreme Shiism poses the greatest long-term ideological threat to the United States and its Western allies, especially as it transcends geography, race, and group. The ability of the movement to mutate and multiply will continue to spawn terrorist and insurgent movements until, and unless, a strategic formula is found to defeat them. The long-term strategic threat to the United States by the toxic nexus of transnational terrorism, rogue states, and weapons of mass destruction is primarily driven by Sunni extremism (with the notable exception of Shiite terrorism, which is primarily state sponsored by Iran). 2. Iraq and Afghanistan. Americans have a penchant for snatching defeat from the jaws of victory. The debate over whether the United States should have invaded Iraq and Afghanistan is long over, and the focus should be on how to achieve victory. Iraq has stabilized and is at a fork in the road on whether it succeeds or fails, whether it progresses or descends into violence, whether it allies with the United States or Iran, and whether American sacrifices were for triumph or tragedy. Iraq has already given a template to the Arabs that an Arab Muslim democracy can be created; for the United States to back away now would be tantamount to betrayal of them and U.S. values. 3. The Arab Spring. Unclear is the depth or sweep of the Arab spring or whether it will reignite the Green Revolution in Iran and topple the Alawite regime in Syria. However, it is clear that at the very time that the Bush Doctrine had promoted Arab democracy in the beginning of the 21st century, the Obama administration has failed to lead. Should this continue, the ramifications will be calamitous: Any hope of democracy, human rights, and civil society could fail; the old or new dictators could take power; the revolutions could be overtaken by Islamic extremists; the region could descend into factionalism and chaos; and other great powers could gain influence to threaten American interests. 4. Energy security. It is, after decades, in vogue to discuss national security and energy policy. The energy policy of the United States must reflect its grand strategy and be based on some fundamental and permanent declarations and actions. 5. Threat to primacy. The United States took a long road to military primacy, which has ensured world order, world commerce, and world peace. It has achieved all three more than any territorial empire in the past and any international treaty or organization of the present or future. 6. Rogue regimes. In 2002, President Bush identified the “axis of evil.” Two of those nations continue to spread evil and malevolence abroad and to their own people. Iran, seeking a Persian-Shiite empire in the Persian Gulf, has engaged in a laundry list of policies and behaviors designed to kill Americans and hurt American interests since 1979. Iran is engaged in a massive campaign to produce its own nuclear weapons; it is engaged in building, modernizing, and developing long-range ballistic missile capability; it is the No. 1 state sponsor of terrorism with groups like Hamas and Hezbollah; it is the No. 1 partner or sponsor of other rogue regimes like Syria and Venezuela; it is the No. 1 conduit for the training and arming of Shiite militias in Iran to kill U.S. troops and Iraqis; it has assisted, when it deems its own interests are at stake, both al Qaeda and the Taliban (regardless of theological differences, just as in the case of Hamas); and it continues to be one of the worst human rights violators of its own people. North Korea is a more difficult problem, as it already has an advanced nuclear and missile program, proving the need to have acted in Iraq and the need to take action immediately on Iran. The Democratic People’s Republic of Korea has developed nuclear weapons and is a massive arms proliferator, counterfeiter of U.S. dollars, drug seller, and, worst of all, the worst violator of human rights on the planet. North Korea operates a vast empire of concentration camps where people are treated worse than animals and punishes any type of dissent with torture and execution. 7. Destabilization of Japan and Mexico. Two U.S. allies, for very different reasons and under very different circumstances, face destabilization: Japan and Mexico. Japan has been in economic and societal turmoil since the mid-1990s and fears abandonment by the United States either in favor of China or for withdrawal and retreat. Japan is a classic example of what happens when a U.S. president fails to operate with muscular, forceful, worldwide leadership. The entire Pacific realizes that the only creator of order and stability in Asia is the United States, just as it realizes that the only sense of order for that ocean is the United States Navy. In a much different setting is the potential for a failed state on the United States’s southern border. The results of a failed state in Mexico are beyond calculation. 8. Israel and Palestine. The United States has been a partner with the state of Israel from the beginning. President Bush turned away from the policy of accommodating Palestinian terrorists in an effort to promote democratic Palestinian forces. There is no other way of dealing with the crisis. The ambiguous signals to both the Israelis and the Palestinians has encouraged the crisis to swell and spread. 9. Crisis of confidence in Europe, and feelings of betrayal in Eastern Europe. The United States has gone to war two times to save Europe. The landscape of Europe is occupied by many American graves. The special relationships with the United Kingdom, France, Italy, Germany, Poland, Hungary, and the Czech Republic, to name a few, are critical to American values and American interests. The term Atlanticist, once a badge of honor, is being relegated to history. NATO, even with some success in Afghanistan and Libya, is on a precipice of an identity crisis. 10. Resurgent Russia and the rise of China. The last great challenge is the same one a young George Washington faced in the French and Indian War—that of great powers. There is no need for bellicose statements of war or aggression, but the simple realization that the interests of a resurgent Russia and a rising China are often going to be at odds with American interests, both in values and in material ways. China also poses a different kind of problem. It is a power that inherently believes in a destiny of greatness with imperial designs. It is focused on the future of dominance, in particular, of Asia. “We’re seventh in literacy, 27th in math, 22nd in science, 49th in life expectancy, 178th in infant mortality, third in median household income, number 4 in labor force, and number 4 in exports. We lead the world in only three categories: number of incarcerated citizens per capita, number of adults who believe angels are real, and defense spending, where we spend more than the next 26 countries combined, twenty-five of whom are allies … We sure used to be the greatest nation. We used to stand up for what was right. We fought for moral reasons. We passed laws, struck down laws for moral reasons. We waged wars on poverty, not poor people. We sacrificed, we cared about our neighbors. We put our money where our mouths were. And we never beat our chest. We built great big things, made ungodly technological advances, explored the universe, cured diseases, and we cultivated the world’s greatest artists and the world’s greatest economy. We reached for the stars, acted like men. We aspired to intelligence, we didn’t belittle it, it didn’t make us feel inferior. We didn’t identify ourselves by who we voted for in our last election. And we didn’t … we didn’t scare so easy. We were able to be all these things, and to do all these things, because we were informed. By great men, men who were revered. First step in solving any problem is recognizing there is one. This television tirade would be of no matter had it stayed in the dystopic universe that is Hollywood, but alas, the internet has pushed the statement across borders and time. The temptation to go line by line and deconstruct this outburst will be resisted, and would do little but add credence to the inanity. It is, naturally, what is not said that is more important, more enlightening, and more reasonable. In many ways it is reminiscent of the constant and continuous calls for America’s demise as a superpower, and those that took joy in those obituaries are the same who propagate rants like this one. These are the analyses that told Americans they were finished after Vietnam, finished after OPEC, finished after the Cold War, and now finished because of the fiscal cliff. American education may be in crises, but it is a crisis that still produces the greatest innovation, the most dynamic entrepreneurs, and unparalleled leaders. We may lack in the ability to take standardized tests that often measure insect-like technicalities, but our best students are without competition. The engine of the world economy still has a “Made in America” label on it, and the sane economic elite of the world hope that there is no change in the pit crew. Our defense spending is unparalleled because our enemies are numerous and our allies lack American leadership directing them. How clever HBO was when it chose to say that we lead the world in defense spending, rather than the important fact, which we lead with the world’s greatest military: an American military that is the only force for good on the planet; an American military that is all that stands between us and the darkness. McAvoy’s veiled attack on religion belittles himself and his creators more than the religion they seek to denigrate. America is not the country where people believe in God because they believe in angels; they believe in angels because they believe in God. Man brought himself out of the mire only by his obedience to God, and if the only variable that differentiated America was this (as opposed to thousands of other elements that do), then America would be the greatest nation. There is only one force for good in the world that has any will or strength to stand against the dark forces of the earth, and that is the United States. If there is hope for the family facing human rights atrocities by brutal dictators, that hope will only come from the United States, but only if that United States has the leadership that it deserves to stop it. The speech that McAvoy might have given, one that would have had some merit, would have been one where American greatness, though not lost, has diminished. This has not happened due to statistics about literacy and household income. This has happened, in what degree that it has, due to leaving traditional American beliefs. This fundamentally comes down to the American adherence to natural law, as immutable, unchangeable, forever, and God given. The late great scholar Russell Kirk, in The Roots of American Order, explained this best with his description of five cities: Jerusalem, Athens, Rome, London, and Philadelphia. The roots of Western Man exemplified by these cities were the well spring of monotheism, Christianity, philosophy, individual morality under God, law, civilization, art, science, and liberty. This all combined to create American civilization. This legacy is the true nature of American Exceptionalism; America is the great inheritor of all the good that came before it. Its greatness will not be judged on manipulated statistics governed by popular culture, whether this is symbolized by a fake reporter on HBO, or worse, by fake newscasters on Comedy Central. It will be judged only on its zeal to fulfill its inheritance. The issue of American allies is often neglected. The mainstream media has propagated a myth that during the George W. Bush years American alliances were hurt and dwindling. They continued the fable by promoting the idea that the current administration has “repaired” the relationship with our allies. Neither of these propositions is true. Not only has the current administration not bolstered the number of American allies, it has actually neglected and hurt the most important ones. In the next few months this column will focus on those alliances: Great Britain, Japan, Israel, Taiwan, Australia, and NATO. We have spent so much of our energy and effort focusing on America’s enemies, we have forgotten that it takes much greater effort to support and bolster our friends; we have spent so much time complaining about America’s burden, we have forgotten that American allies want American leadership, strong and steadfast. However, just as in any friendship, this requires sacrifice and sincerity. If there is a real version of “American Foreign Policy 101” it would have a simple subtitle: “Be friends with the British.” There is simply nothing more fundamental to the present or future of the United States than solidarity, friendship, and support for the United Kingdom. The antics by the current administration surrounding our relationship with the United Kingdom of Great Britain and Northern Ireland are legion. It began with former Prime Minister Gordon Brown’s 2009 visit and the removal of the bust of Prime Minister Winston Churchill from the Oval Office. These genesis events illustrated either a deep vein of naïveté or a gross miscalculation. This is why the removal of Churchill’s bust from the White House was no mere act of whim, but either a calculated snub or incredible incompetence. The bust, given to the White House following the 9/11 attacks was a token of Anglo-American unity, and was a physical symbol of Churchill’s rhetoric. Before leaving on his trip to America, Prime Minister Brown stated, “There is no international partnership in recent history that has served the world better than the special relationship between Britain and the United States.” Here is the key point: “served the world better,” not merely the two aforementioned nations. The entire system of international stability and order is predicated on this special relationship. The dust up regarding Prime Minister Brown’s visit concerning the ill-conceived DVD gifts from the Obama’s, the lack of a Camp David invitation, and the curtailment of the regular, important, and symbolic Star Spangled-Union Jack press conference, were all small indicators of the same problem that the return of the bust represented. Two explanations were hastily concocted. The first was that President Obama’s aides were “unfamiliar” with the expectations of a visit by the most important American ally; the second explanation was that the White House had been too “overwhelmed” by the economic crisis to attend to foreign policy. Is either of these credible or possible? If we cannot get it right with the Brits, how can we dream of it anywhere else? The most disturbing piece to come out of this affair was the comment, reported by the Sunday Telegraph, of an unnamed State Department official involved with planning the prime minister’s visit who was quoted as saying, “There is nothing special about Britain. You’re just the same as the other 190 countries in the world. You shouldn’t expect special treatment.” Hope for a better relationship was frittered away when the administration presented Queen Elizabeth an iPod as a gift containing audio files of President Obama’s speeches. This occurred while the first lady broke protocol by touching the queen, an act from an administration who enjoys lecturing the previous one on cultural sensitivities. In 2011 the president continued to speak at Buckingham Palace while the British national anthem was playing. These might all be brushed off as the actions of an inexperienced administration that fails to understand the basics of American foreign affairs. However, there is a darker, more pragmatic side as well. Currently, the anti-British attitude of the Obama administration most difficult to understand was and is over the Falkland Islands. The Falkland Islands are British; they re-established their sovereignty by force in 1982 with the help of the Reagan administration. The Obama administration is now pushing for Great Britain to enter into United Nations sponsored negotiations with Argentina to discuss the issue of sovereignty. If this is not an example of national security tone deafness, then there isn’t one. There were 46,000 British troops fighting alongside the United States in Iraq and there are 9,000 British soldiers in Afghanistan. They have consistently been the second largest force fighting the global war on terror. More than any other country, they have faced the greatest threat of Islamic extremism inside of their own country. Many Americans and British take the relationship for granted. We have all heard the derision of the pseudo intellectuals with phrases such as “all the United States has is the British.” If there is a book of phrases for ignoramuses, this should be in the top five. The Anglo-American special relationship is not just a set of realist shared interests, magnified exponentially by the war on terror, but also a shared cultural and political destiny rooted in Anglo-American ideas of natural law, liberty under law, and Western civilization. It was Winston Churchill in Fulton, Mo., who first made the phrase famous when he said, “Neither the sure prevention of war, nor the continuous rise of world organization will be gained without what I have called the fraternal association of the English-speaking peoples. This means a special relationship between the British Commonwealth and Empire and the United States. This is no time for generalities, and I will venture to be precise.” This salient concept has guided American foreign policy and national security as the anchor for more than 50 years. The Obama administration’s perceived coolness towards the British, if true, is a colossal misunderstanding of American history, culture, and politics and is, hopefully, not be an indicator of the new term or a new direction in American foreign policy, as this is not reminiscent of “hope” and “change,” but of coarseness and childishness. The destiny of the English speaking peoples is only true and good if it is a shared destiny. The United States and the United Kingdom share that destiny more than any other. This will take all the blood, toil, tears, and sweat that both sides can muster. Space… the final frontier. These are the voyages of the American people. Its permanent mission: to explore strange new worlds; to seek out new life and new civilizations; to boldly go where no American has gone before. The above homage to the opening lines of the real Star Trek, the one where an American from Iowa was the captain, may seem odd at a time when the majority of the country is concerned about gas prices and mortgages, and those that are paying attention to events outside their hometown are focused on Afghanistan and the Iranian nuclear program. However, it is precisely at this time that a call for American primacy in space must be made. Last Friday, December 7, marked two anniversaries that are locked together by fate and destiny. It was the 40th anniversary of the last manned mission to the Moon and the 71st anniversary of the attack on Pearl Harbor. Should we neglect the space race, the threat of another such attack looms large. Much was made in 2009 when America went back into space with the Ares I-X rocket. However, unless the United States is serious about being a space-faring people, this will be a mere sideshow experiment. In January of 2004, President Bush called for a “renewed spirit of discovery” where America would again take the lead as the primary space-faring people. “We will build new ships to carry man forward into the universe, to gain a new foothold on the moon, and to prepare for new journeys to worlds beyond our own.” This sentence hearkened back to the 1962 when Americans were challenged by President Kennedy to take their civilization and values to the stars. The fundamental piece of President Bush’s speech was the American commitment to manned space exploration, with a near term goal of a manned mission to Mars. This may have been missed by the media or popular culture, but it is the salient point. America needs not only to lead technologically; it needs to lead by example through a robust space exploration program with astronauts. The 10 member Augustine Commission reported in 2009 a pessimistic scenario of the space program, being limited to near earth asteroid exploration and to “gravitationally significant” points in space, known as Lagrange points. This will do nothing to inspire the generations of Americans alive now and in the future. It is time for President Obama to call for Americans to rise up to the challenge posed by President Kennedy. This cannot be done on the budget of $18.7 billion dollars, equating to a paltry .48 percent of the federal budget. We are spending less on the most essential aspect of America’s future than we did on the automobile industry bailout. This fiscal absurdity occurs while we are forced to hitchhike into space on Russian rockets. The spending on the space program will determine whether or not America will lead in space, create the next advances in medicine, receive the benefits from space technology and be able to dominate the next battlefield. Whether we like it or not, the militarization of space is inevitable. The question is not if, but when. The civilization that is first past the post here will be first past the post permanently. There is nothing short of American superpower status at stake. The country that dominates space and space exploration will also have the most vibrant and dynamic economy, the most advanced, high-paying jobs, and a technological edge that is second to none. It is a national security and economic imperative, where anything else palls in comparison. It is up to the president to explain to the American people how the need is more than ever, not less. It is up to the president to place it squarely and fully in the context of the economic crisis, not shy from it. The president should make both an ideological and practical case for the space program. On the ideological side he needs to hearken back to President Kennedy demanding that America and Americans must lead this human endeavor, that the banner of freedom and democracy must be at the forefront, and that it is not only our challenge, but our duty and responsibility. If not us, who? If not now, when? On the practical side he needs to make the national security and economic case in stark and clear terms. The cost of both, for another power to supersede us, would be catastrophic at every level. The one presidential candidate who understood this concept, Newt Gingrich, and was serious about space and its ultimate role in national security, technology, and economics, was unjustly mocked. There are specifics that should be stressed. First, NASA must be given the flagship duty again. It must be NASA, not the private sector, as an arm of the American government, representing the American people, that explores the final frontier. NASA needs to have the resources, backing, and support of the White House. This needs to be public and overt. The first manned exploration beyond the Moon must be under a NASA aegis. Second, a firmer commitment to manned exploration must be made. The dalliance with probes and robotics is fine for the purpose to advance manned exploration, not the other way around. Third, there must be real commitment to build the space elevator, the result of which would be to reduce the cost of putting weight into space from $10,000 dollars per pound to $100.00. This could be operational within 15 years with a cost of $10 billion. It is the linchpin to future space exploration, a permanent lunar base of operations, future space mining concepts, and a fully comprehensive space based missile defense. Fourth, promote the development of a real starship (perhaps based on fusion technology) instead of single use rockets, or limited use shuttles. Although the technology is not there yet, the promotion of this in a “Kennedy-esque” manner might generate new ideas and concepts that could advance our understanding. Fifth, inspire the American people to promote the space program, the heroism of NASA, the necessity of space exploration, and tie our future to it. The space program, and manned space exploration in specific, are the keys to America’s future, not only as a global superpower, but as the leading economy. The two cannot be separated, and neither of them will have a future without America leading the way, now, not in some murky future. It is precisely because of the economic downturn, the threats posed by other great powers and rogue states, that this is the time for such a clarion call. This time needs to be capitalized on, to advance the real need for a renewed American commitment to space. The country that makes this commitment will be the country with a secure future. Living in a city like Vienna, one feels as if one is in a living museum. Vienna was not only the final redoubt for European civilization in 1683, but was the heart of the system that governed international relations from 1815 to 1914, known as the Congress of Vienna. The Vienna of today, exemplifies much of what ails European foreign policy and trans-Atlantic relations: the lack of a dynamic goal and a failure to build upon roots that made the civilization great. The European Union is in disarray, and NATO is searching for a redefinition. This is happening while the United States has made no clear signal as to the future of Atlanticism, NATO, or leading the West. The world has emerged from the so called post-Cold War era transitioning through three phases of American leadership. Phase I under the Bill Clinton presidency illustrated national security and foreign policy drift. Phase II under President George W. Bush exemplified clear national and global goals driven by events in the Middle East and Central Asia. Phase III under the Barack Obama administration is similar to Phase I, but has embraced a policy of “leading from behind.” Meanwhile, the world’s geopolitical situation has shown signs of three major threats that will require a new international order. These threats are a resurgent Russia, a rising China, and the waning and waxing fortunes of Islamic extremism. This does not count the numerous middle level and low level threats that dot the international landscape. The successful Pax Romana and Pax Britannica were much more triumphant than the multipolar order making attempts such as the Congress of Vienna or Versailles Treaty. The most successful international order maker has consistently been the United States and the Pax Americana. In order to ensure the continuance of international stability many strategic decisions must be made. One of these decisions concerns the future of American international leadership: A dynamic international system must rise to meet these challenges, a system where the United States spearheads the creation of an amplification of NATO by fostering the D.A.N—Democratic Alliance of Nations. The United Nations, an attempt by leaders like President Franklin Delano Roosevelt to inject some realism into the failed League of Nations by creating five policemen has failed. It has failed to create stability and order except in those instances backed by the use or threat of American force. The current situation in the United States is one of war weariness and fear of over extension. The president will need to gain electoral support for America’s preeminence in world affairs. A new organization, one that has credibility with the American people, could go a long way to solving all of these issues. This new dynamic organization could go by many monikers; the one used here is the D.A.N. The Democratic Alliance of Nations would model itself on NATO, and if successful could replace NATO and cease the endless bickering about the future of that historically critical organization. The basic essence of NATO would remain; this would include a supreme commander that would be an American, a rotating political head, and Article 5 would serve as a similar trigger for action. However, there would be some drastic differences as well. Only nations that were willing to employ proportional military force (not token support) would be allowed membership. The Article 5 style trigger of “an attack on one is an attack on all” would be broadened. These triggers would have to include preemptive and preventative threats, as well as a mechanism to deal with genocide, massive human rights abuses, regional despotism, rogue states, and failed states. Further, there would have to be a clear mandate that military force would and could be used under these trigger conditions. This does not mean that military force would be the first or only option; but unlike the Security Council, it would be a viable coalition response. Critical to the composition of the Democratic Alliance of Nations would be that membership be reserved for only true democracies. This would be subject to scrutiny of the founding members and include such benchmarks as working democratic constitutions; the real rule of law; a vibrant civil society; the full protection of private property; and obedience to natural law. The foundation of the organization would have to start in the Anglo sphere (United States/United Kingdom/Canada/Australia/New Zealand) which would bring in elements of both NATO and ANZUS. Membership would hopefully be expanded to states such as (but not only) those in Western and Central Europe, Israel, South Korea, and Japan. Obviously, it goes without saying that some of these nations would need to make fundamental changes in their foreign policy legal mechanisms and even political culture. It would therefore be through the Democratic Alliance of Nations that the United States could lead the free world in a dynamic 21st century, as it had through the tribulations of the 20th. It would further the security of the United States and the American people, and would serve as a way to illustrate to the electorate that the United States is not forced to act alone nor bear the only burden. It would further enhance the political and economic connections of members for stronger ties and bonds.